This whisky is a pale yellow with an equally subtle nose of honey, corn, grassy peat and feint smoke; however, the alcohol is not so subtle on the nose. A couple of splashes of water reveal toffee and a hint of vanilla. The taste is peppery, tangy and woody. There are hints of vanilla and honey, but mostly the bitterness of wood and a peppery burn that remains as a bit of dull smoke arrive. There is a brief taste of ginger up front as well. I’m not impressed with this one. This was distilled in 1997 at Longmorn and aged in cask 163309 before bottling in 2011 by Berry Brothers and Rudd. This is a complex, full-bodied and aromatic whisky, with honeyed, malty flavour. 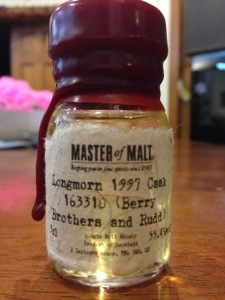 This entry was posted in Whiskey and tagged Berry Brothers and Rudd, Longmorn, Single Malt, Speyside. Bookmark the permalink.